Head cheese. Liverwurst. Clotted cream. The names of these foods are anything but appetizing. But clearly the most disturbingly named food in existence, even worse than head cheese, is the Dutch Baby. It’s not so much the name itself–I mean, Dutch Baby sounds kind of cute, right? But then when working on a post for your food blog about said Dutch Baby, you find yourself writing (and then scratching out and rewriting) sentences like, “I always cook Dutch Babies in a cast iron skillet” and “Some people like to top Dutch Babies with butter and sugar, but I prefer fruit.” Oh, the horror! So when my husband and I were grocery shopping for the week and he asked me what we were having for dinner that night, I was a little bit self-conscious about telling him in public. I looked around to make sure no one was within earshot and then I whispered, “A Peach Dutch Baby.” Which, you know, I’m sure wasn’t suspicious at all! Not one bit! Because really, when you’re trying not to arouse suspicion, the best thing to do is dart your eyes back and forth and say things under your breath. The first time I had a Dutch Baby was at The Original Pancake House in Monona, Wisconsin. If you haven’t had one before, it’s a fluffier, eggier version of the regular pancake. It’s typically topped with powdered sugar, butter, and fresh lemon juice, but the Pancake House has a version topped with sauteed apples that is out-of-this-world amazing. And it’s huge. Huuuuge. I can never finish one myself, but the sad thing about Dutch Babies is that they deflate really quickly and the leftovers are never as good as when they’re fresh out of the oven. Since peaches are in season, I thought I’d top my Dutch Baby with those instead of apples. I added only a minimal amount of butter and sugar to the topping because there’s already so much butter in the pancake itself. Oh yes, there’s butter. But it’s okay, because this isn’t an everyday breakfast. It’s a special breakfast–a sleep-in on Sunday and whip up something fantastic breakfast. 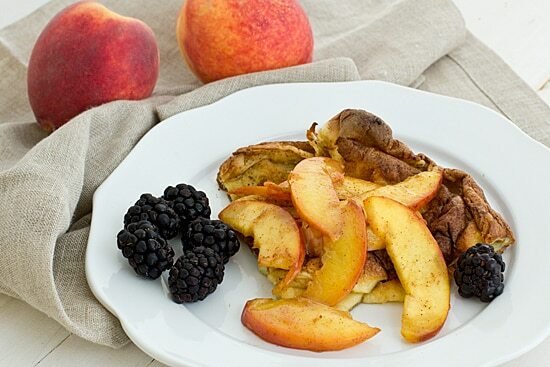 A baked pancake topped with sauteed peaches. Adapted from Good Eats’ Dutch Baby Recipe. Heat butter in a large skillet over medium heat. Add peaches, brown sugar, and butter. Cook, stirring frequently, until peaches are softened but not mushy, 7-10 minutes. Remove from heat. Position rack in center of oven and preheat to 375 degrees. 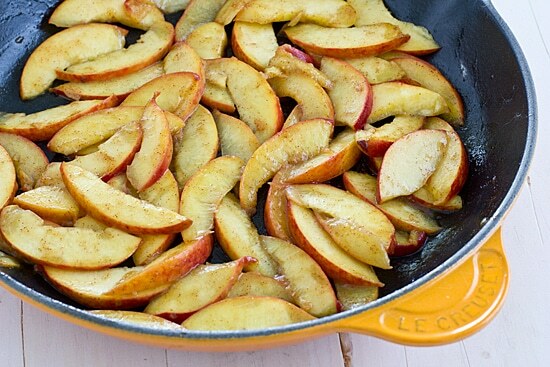 Coat a 10-inch cast iron skillet with 2 tablespoons of melted butter. Place in oven and wait 10 minutes before assembling remaining ingredients. After 10 minutes have passed, combine flour, sugar, salt, milk, eggs, and remaining melted butter in food processor or blender. Process for 30 seconds. Pour batter into preheated cast iron skillet. Bake for 15-30 minutes or until pancake is browned and puffed up. Oven temperatures vary, so it’s important to keep an eye on your Dutch baby to make sure it doesn’t burn! I’ve always wanted to get one of those things at the pancake place when we were in Chicago. I may try this with apples first and then do the peach one. The term dutch baby makes me 1) laugh 2) think of the term food baby or 3) the awesome omelet I get at Eggsperience in Chicago which looks like a swaddled infant! Figure out a way to lighten up this recipe and I will love you forever. I’m from the Chicago area–how have I never heard of this swaddled infant omelet restaurant?! Your kids will be horrified! I love making Dutch Babies. So far, I haven’t gotten past making them with mixed berries, simply because I love them so much. I’ll have to try peach. You are so funny! I never really thought about the name before but it is kinda wierd. I had my first at an original pancake house too. Love them! I so miss living near an OPH. We only went there a few times a year, but man is it good. I’m with you on the name. And “curd” is such a gross name for that lovely lemon like jam that I love to put in tats. making a “curd” tart just sounds gross. But I use to make Dutch “pancakes” all the time, I need to make one again this weekend…with beer. Yeah, the word “curd” is pretty gross–just the way it sounds when you say it is so unappetizing. Cuuuurrrrd. Ew. 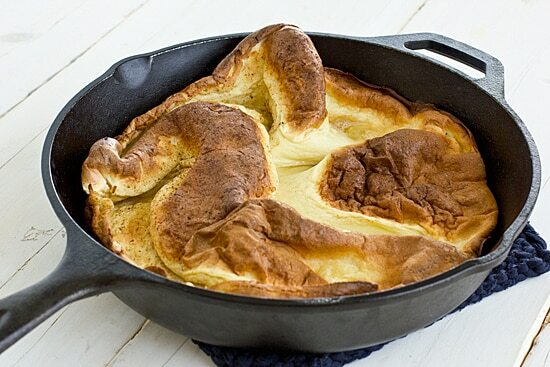 …and you know I’m going to be stalking your blog for a beer Dutch baby recipe. You better deliver! YES! I love Dutch Babies and with peaches in season, this will have to be made! Never thought of them that way, LOL! They are so good. Especially with fruit. ROFL….These sound so good, but I agree the name leaves a little to be desired. I love peaches. I love peaches too–I’ve been using them in every possible way I can think of while they’re in season! We call them German Pancakes. Yummy is what they are. You’re right, what a bizarre name! But people DO always want to “eat my babies cheeks/neck/etc.” – I try to keep those “friends” far away 🙂 The taste totally makes up for it with these!! Yeah, that whole, “Oh, I just want to eat her up!” comment that people say about babies all the time is a little bit disturbing when you think about it, isn’t it? That looks very interesting. My hubby is not a pancake person but am thinking he might like this. I don’t care for plain pancakes very much either–even with maple syrup, I find them a little bit tasteless. Dutch babies are much better, IMO. Haha, yes dutch babies are hard to talk about. They are soooooooo good though! You know another curd that sounds unappetizing? Bean curd. I guess tofu sounds better. You were cracking me up with the bit about whispering in the store! I’m Pinning this for a lazy Sunday morning. And so many restaurants put “bean curd” on the menu instead of tofu! I saw the name Dutch baby and was really curious, great post! You are hilarious. I always wanted to try a dutch baby. I should make this sometime. It looks so yummy! Definitely give it a try. They’re a little bit fussy with the baking in the oven and all, but so worth it! I grew up eating Dutch babies as a special breakfast treat sometimes, but funnily enough I never thought much about how weird the term actually is! I also never understood why the recipe called for so much butter…now when I make it, I reduce the amount a lot. I think I’ve only ever tried them with fresh strawberries, but a peach version sounds amazing too! Ooh, I never thought to try to reduce the amount of butter in the pancake itself, just the topping. I’m a bit of a nervous baker, so I tend not to adjust ratios too much. I was thinking more of the amount of butter that they call for just to melt in the pan – my mom’s recipe seems way too high! I can’t remember if I reduce the butter in the batter too – it’s been a while since I’ve made one! Why do some foods have such names?? You readers from the Chi-town area, a close 2nd to this delicious-sounding recipe is the deep-dish apple pancake from Walker Bros. at several locations around the NW neighborhoods. It’s pretty here in Virginia and you eventually do get used to a different philosophy of cooking/baking but I wish I could transport to IL every now and then to snarf down the pancake I loved for years.